This non powered pressure mattress uses a closed cell system that redistributes pressure. Unlike most alternating pressure mattress systems these cells do not need to be replaced and there is no need for a powered air pump. The pressure is evenly redistributed to heal and prevent bed sores and painful pressure points. This new technology uses a high resilient foam with engineered air chambers to evenly distribute the patients pressure over the entire therapy zone. This therapeutic hosptal mattress is an inexpensive option in non powered pressure relief. Designed using a combination of high resilient foam and air to offer optimal pressure relief and healing against bed sores. 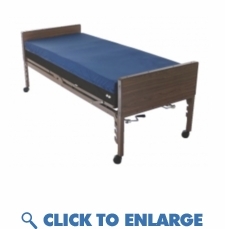 This hospital mattress comes with a waterproof, breathable, fire retardant , anti microbial cover. The defined firm edge perimeter assists with patient transfer and offers a sloped heal for extra protection. Designed for optimal pressure relief. Heals up to stage 4 bed sores. Available with either a multi-direction stretchable cover with a high MVT rate or a 70 denier nylon cover with a low MVT rate. All covers are removable and interchangeable. The base cover utilizes an anti-microbial and an anti-static heavy duty PVC material coated with a non-skid material in order to prevent sliding. The heavy duty foam cavity adjusts to the shape of the cells and increases both edge stability and useable sleeping surface for increased performance and comfort. The twelve 5.5” high air cells are made from high strength nylon/polyurethane and are filled with three different tri-laminate foam cores which provides the proper support in the right area. The sloped foot section allows for additional reduction of pressure in the sensitive heel zone. A 1” visco foam comfort layer and a high density 5-zoned convoluted foam comfort layer are on top of the air cells providing the patient with supreme comfort. A high density foam base is positioned below the air cells protecting the air cells from damage which can be caused by the beds metal springs. Easily connects to an alternating pressure pump with quick connections.